Architecture gives meaning to place. From the smallest house making a place “home” to one person to the Great Pyramid of Giza being known as a “wonder of the world”, in fact, the only remaining wonder of the ancient world, the building is the difference maker. On a grand scale, these buildings come to symbolize a culture. The Colosseum in Rome is now less about Emperor Vespasian and his son Titus, who built it, and more about what it tells us about the Roman Empire and the popularity of its gladiators and their battles for sport. New York City’s Art Deco Empire State Building is as much a symbol of American ingenuity, innovation and triumph as the Statue of Liberty serves as a symbol of welcome and hope to generations of immigrants. The purposeful destruction of cultural symbols around the world in wartime are devastating losses to our global landscape as well as our cultural identities. Syria, one of the oldest inhabited regions, has suffered unspeakable losses during its ongoing civil war. Shown here is the Great Mosque of Aleppo, which dates back to 715 CE (Common Era), making it among the oldest mosques in the world. 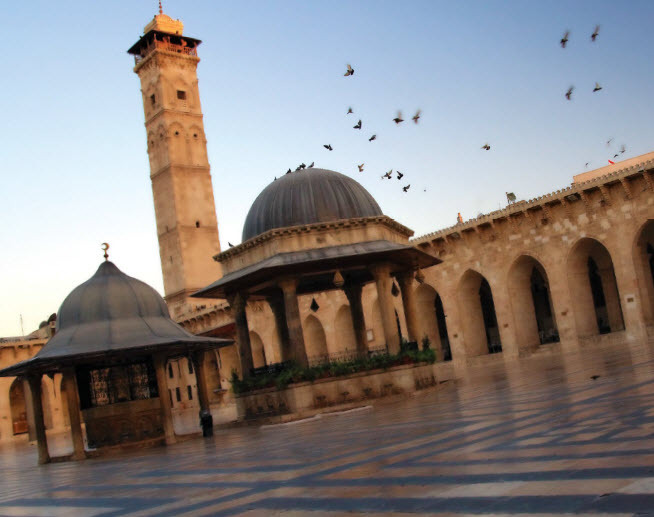 Having sustained considerable damage in 2013, including toppling the minaret, historians describe the damage as the worst ever damage to Syrian heritage. While destroyed icons cannot always be salvaged or rebuilt, there is some recourse. In September, Ahmed al-Faqi al-Mahdi was sentenced to prison by the International Criminal Court in The Hague for his role in the destruction of nine mausoleums and the door of a mosque in Timbuktu, Mali in 2012. This is the first time that the destruction of religious or cultural heritage has been treated as a war crime. “Deliberate attacks on culture have become weapons of war in a global strategy of cultural cleansing seeking to destroy people as well as monuments bearing their identities, institutions of knowledge and free thought,” according to UNESCO, the United Nations Educational, Scientific and Cultural Organization. Purposeful destruction of cultural symbols in wartime are devastating losses to our global landscape as well as our cultural identities. Surveyors, archaeologists and historians work to create 3D maps and images of destroyed sites to preserve memories of buildings that are otherwise lost.